SAN JOSE, CA--(Marketwired - May 14, 2014) - Cypress Semiconductor Corp. (NASDAQ: CY) today introduced its fourth-generation 2.4-GHz WirelessUSB™ radio-on-a-chip. The new WirelessUSB NX transceiver delivers Cypress's hallmark robust performance along with ultra-low power consumption, aided by a fast 2 Mbps data rate to limit time spent transmitting and receiving. The solution enables three years of battery life for wireless mice, keyboards, trackpads, remote controls and other Human Interface Devices (HIDs). Cypress is the only supplier to offer a complete HID solution, supporting advanced features and streamlined designs with WirelessUSB NX, low-power microcontrollers and best-in-class capacitive touch sensing technology. End users demand long battery life for wireless HIDs, making a low power consumption radio a must. WirelessUSB NX operates at 900 nA in sleep mode where HIDs spend most of their time, and it offers low active current of 12 mA in transmit mode and 15 mA in receive mode. As with other Cypress WirelessUSB families, the NX radio offers superior performance in the presence of common 2.4-GHz interference from sources such as WiFi, Bluetooth, cordless phones and microwaves. WirelessUSB NX is complemented by Cypress's highly integrated enCoRe™ VI microcontroller, PSoC® 4 system-on-chip devices and complete trackpad modules for sleek, robust touch interfaces, offering manufacturers a single source of supply and support. "Cypress provided a complete solution for our ZTM600 touch mouse, which is bundled with the Lenovo High-End All-in-One series of PCs," said L.M. Ding, project manager, at Lenovo. "The WirelessUSB NX transceiver provided low-power wireless connectivity while the enCoRe VI controller integrated touch sensing and system control, thereby reducing BOM cost." "Our WirelessUSB NX solution delivers an industry-leading combination of low power consumption, robust connectivity and support for advanced features," said Jayant Somani, Senior Marketing Director of Cypress's HID Business Unit. "Cypress is the only supplier that can provide a complete wireless HID solution, with top-quality, low-power wireless radios, flexible microcontrollers and world-class capacitive touch sensing." 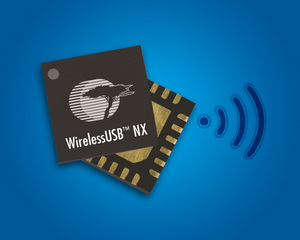 WirelessUSB NX offers compatibility with common RF devices that are currently designed into wireless HIDs. Compatibility with these solutions enables customers to reuse existing firmware to reduce development time. The Received Signal Strength Indicator feature on WirelessUSB NX supports a 5-bit reading for signal strength and a 4-bit reading for noise strength. This provides more accuracy and finer control for wireless systems. The WirelessUSB NX transceiver is offered in an RF-tested 24-QFN package (CYRF9935) and is available today in production volumes. WirelessUSB transceivers operate in the unlicensed 2.4-GHz Industrial, Scientific and Medical (ISM) radio band, delivering the best combination of performance and cost versus competing wireless technologies. Featuring a highly integrated radio transceiver plus digital baseband on a single chip, WirelessUSB enables designers to significantly decrease development time, component count and system cost while improving operating range, power-consumption and latency. Cypress delivers high-performance, mixed-signal, programmable solutions that provide customers with rapid time-to-market and exceptional system value. Cypress offerings include the flagship PSoC 1, PSoC 3, PSoC 4 and PSoC 5LP programmable system-on-chip families. Cypress is the world leader in capacitive user interface solutions including CapSense® touch sensing, TrueTouch® touchscreens and trackpad solutions for notebook PCs and peripherals. Cypress is a world leader in USB controllers, which enhance connectivity and performance in a wide range of consumer and industrial products. Cypress is also the world leader in SRAM and nonvolatile RAM memories. Cypress serves numerous major markets, including consumer, mobile handsets, computation, data communications, automotive, industrial and military. Cypress trades on the NASDAQ Global Select Market under the ticker symbol CY. Visit Cypress online at www.cypress.com. Cypress, the Cypress logo, PSoC, CapSense and TrueTouch are registered trademarks and WirelessUSB and enCoRe are trademarks of Cypress Semiconductor Corp. All other trademarks are property of their owners. The Cypress WirelessUSB NX transceiver delivers robust performance along with ultra-low power consumption, aided by a fast 2 Mbps data rate to limit time spent transmitting and receiving. 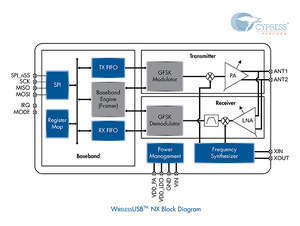 This block diagram shows the Cypress WirelessUSB NX transceiver.